Hi all! Marisa from Laela Jeyne Patterns here! 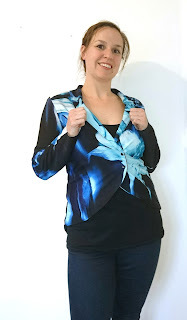 As part of Tester Appreciation Week, my tester Stacey wrote up a post about my newly released Dakota Blazer for Women. Stacey is an awesome tester who always gets things done on time and most of the time early! I appreciate her especially because she tested the Dakota for me and was extremely patient and understanding when there were edits that needed to be made. Thank you so much Stacey and to all my testers! I appreciate your work more than you could ever know! I do love a good jacket, and the Dakota Blazer is a great jacket!! This pattern has some great options - 4 different sleeves - length variations and the option of a pretty scalloped shape at the wrist, and two options for the hem - straight or curved at the back. For my blazer I went with the curved back and long scalloped sleeves - I used scuba knit to sew this up, which worked great because it holds its shape and has a really good structure to it. The pattern has front and back darts, which give a lovely fitted shape to the jacket - very feminine, and great to make you feel a bit more dressy, even if your just wearing jeans! I have worn this blazer loads already since making it - to work, out in the evening and just out and about shopping! 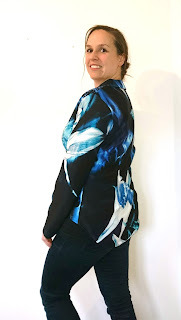 Don't be intimidated by sewing yourself up a jacket - although this pattern is aimed at the intermediate sewist, the instructions are written very clearly and Marisa has used both illustrations and photographs to really make the images as clear as possible, so I think an adventurous beginner could definitely have a go this pattern too!!! I think the best way to improve your sewing experience is to push yourself a little every now and then! Marisa put so much effort into getting the fit of this jacket just right, and tweaked it little by little - I think it was well worth it, and the result is a really great pattern!! 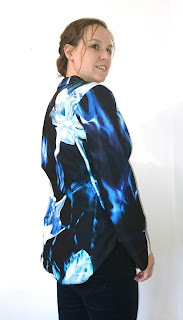 You could get so much use out of this pattern, depending on the fabric you use, this could be worn year round. 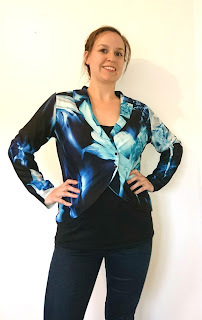 Also included in the pattern are instructions to lengthen or shorten the pattern pieces depending on your height, and this blazer could even be worn as maternity wear because the shape around the front is perfect to fit a bump in to!!! If you're interested in purchasing the Dakota Blazer, you can get it here!